Virgin Galactic’s VSS Unity conducted her second powered test flight on Tuesday, taking another step towards being ready to enter service with paying customers. That milestone is years behind schedule, further delayed by the disastrous test flight that resulted in the loss of VSS Enterprise in 2014. However, the company is now back on an upward trajectory. 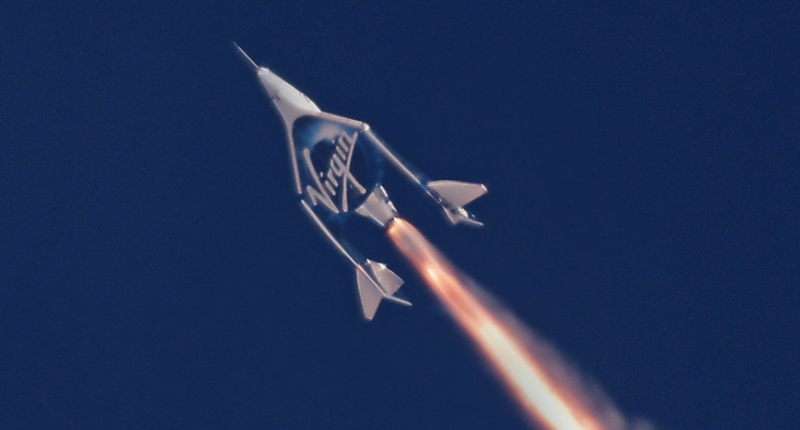 Those setbacks and delays have failed to halt Virgin Galactic’s goal of sending paying customers on a suborbital trip into space, despite growing competition from other companies such as Blue Origin – a company that is deep into its test program with the New Shepard vehicle while preparing to enter the realm of orbital launches. Virgin Galactic’s return from the disaster of the 2014 test failure is centered around a replacement spacecraft called VSS Unity. Numerous tests had already been conducted on the upgraded vehicle ahead of the milestone of the first propulsive test less than two months ago. That test was a success, allowing for a relatively speedy turnaround for the second powered test on Tuesday. The focus of the latest test flight was to learn more about the spaceship’s supersonic handling characteristics and control system’s performance with vehicle parameters that were closer to the ultimate commercial configuration. “This involved shifting the vehicle’s center of gravity rearward via the addition of passenger seats and related equipment,” noted Virgin Galactic, potentially pointing to the test program entering the final stretch before allowing passengers on the vehicle. However, a full duration flight – highlighted by a full duration burn of the rocket motor – will be required before the end of the test program is in sight. For this flight, the motor burned for the planned 31 seconds – which is less than the full flight duration – propelling Unity to a speed of Mach 1.9 and an altitude of 114,500 ft.
At this point, Unity’s re-entry feathering system was deployed for the initial descent before the final glide home to a smooth runway landing at the Mojave Air and Space Port. Branson was at the center to also take in a tour of the facilities of The Spaceship Company (TSC), Virgin’s Galactic sister company. TSC is focused on manufacturing next generation aerospace vehicles, with a primary focus on new spaceships for Virgin Galactic’s future fleet. Notably, Virgin Galactic noted Branson viewed the next two spaceships on the TSC’s manufacturing line, as well as the production facilities for TSC’s spaceship rocket motors. For this latest test with VSS Unity, the pilots were Dave Mackay and Mark “Forger” Stucky. In addition to the pilots of VSS Unity, CJ Sturckow and Nicola Pecile were the pilots of the carrier aircraft, VMS Eve. The teams will now conduct flight data review for this flight and continue planning preparations for the next flight. No date was provided on the schedule for that third flight or if it will include a full duration burn of the motor. However, Branson – who is set to be one of the first passengers on the vehicle when she passes her test program – was understandably overjoyed with the performance of the spacecraft.